I passed this display on my travels and just had to return and shoot it. 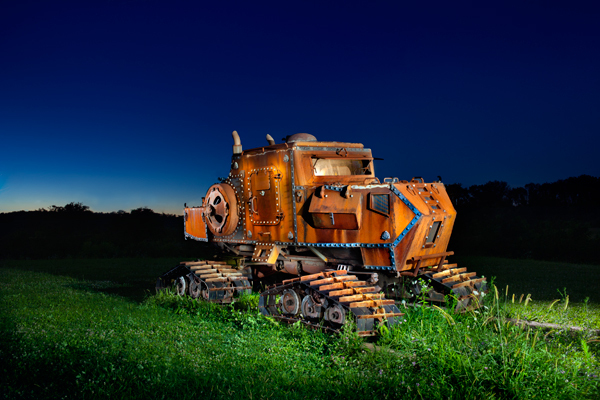 This is the result of many pops of my flash,and several ambient exposures. 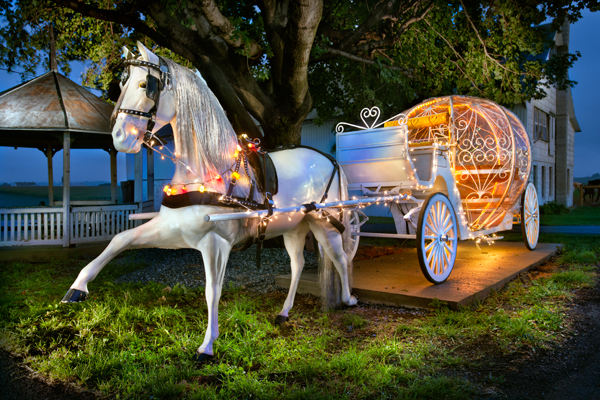 The main ball on the carriage is covered in plastic, which at first kind of made me wish it was off,but after dusk,the plastic helped with the glowing effect,so it all worked out. The owner told me this setup cost $17,000, and they are going to do tourist rides and weddings, using a real horse of course. It supposedly was in a popular TV series based in New York City. I am sure many cinderella’s will be drawn to take a ride. 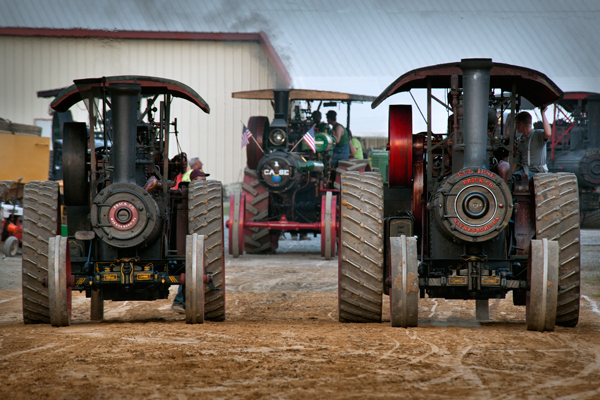 While this looks like two steam tractors racing,it actually is a competition to back up and hook up to something. 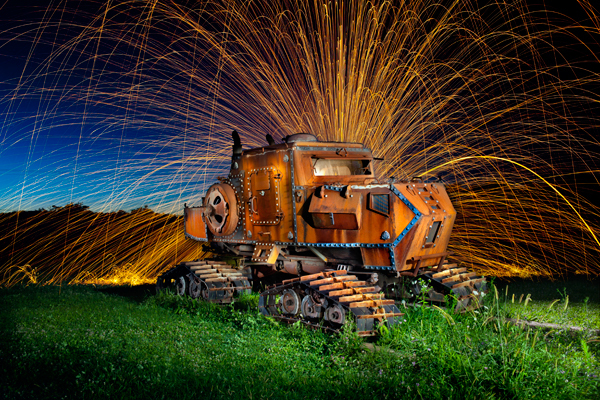 This was shot at the rough and tumble reunion in Pennsylvania and the event includes all kinds of powerful machines from the past. You should see the drivers work the steering mechanism on these things,as it’s a real workout. This might be the last pair of images from this subject unless I come up with something more imaginative. To be honest,I was somewhat disappointed with my burning steel wool result and perhaps that’s because the rusty subject gets lost in the burning embers? I only tried about five steel wool spins due the fact that I was right by a busy highway and I didn’t want the cops harassing me. The bottom image is the same as the top except for sparks,and that was light painted using my flash. For those not familiar with burning steel wool, you need fine grade steel wool,which burns better than coarse,and a device to spin it. I took a steel kitchen whisk, which holds the steel wool inside and then I took a wooden handle and mounted a pulley with a screw that allows the pulley to freely spin and then attached a steel cable to the pulley and whisk. I simply load the whisk with steel wool,light it and then start spinning the thing rapidly. As the air hits the wool,it becomes a raging flame thrower, so wear protective clothes,eye protection etc. Always have a fire extinguisher handy and do it when its damp outside at your own risk. One steel wool pad burns about 30 seconds or so and you should also keep your camera out of the ember zone.One guy on the net had a Nikon 14-24mm lens get messed up when an ember fused on his front element. 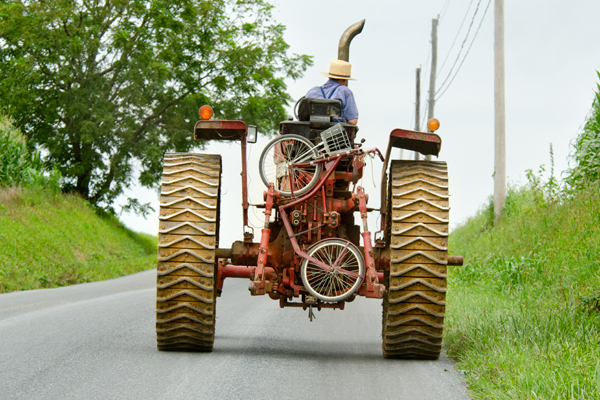 Captured this Amish youth heading down the road on a tractor and upon closer examination,you can see he is hauling his transportation with him on the back. 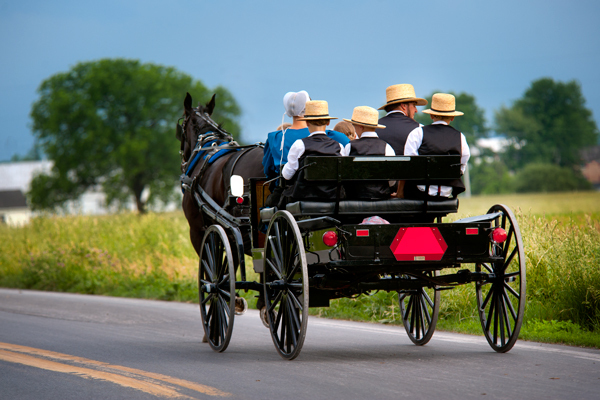 The two-wheeled scooter is the transportation of choice for Amish youth,as bikes are frowned upon. 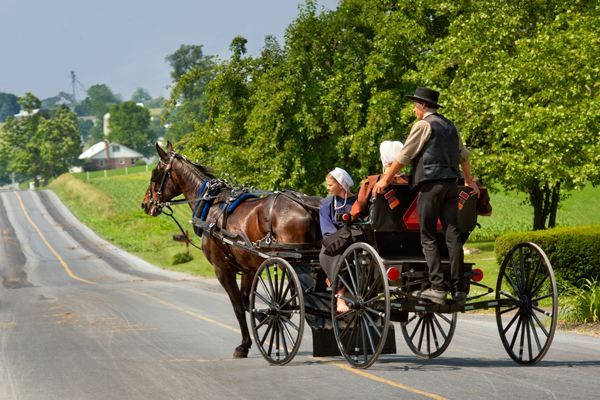 Last year I spoke to an Amish guy who I noticed coming up a hill at a rather fast pace,and it puzzled me how he was doing it? Turns out he had an electric motor added and it was all hidden on the frame. It intrigued me enough to think about buying one since he said it ran about $400 for everything. Well in the year since he got his,price went up to near a $1000 so I will stick with the bike for now. 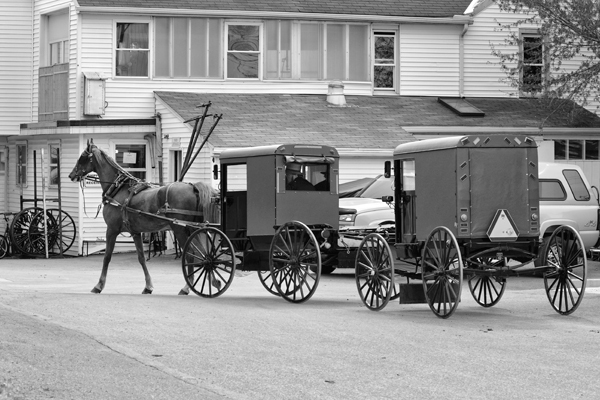 This Amish fellow had to ride on back of the buggy to get where he needed to be, and that was to pick up his own buggy which is just to the left in a driveway.It sure beats walking . A sunday evening ride with the family and everyone is looking their best.